Fern Large Wines from our Crystal Collection appear on the dining room table of the Southampton estate of David Hidalgo and Mary Ann Tighe in the July/August issue of Architectural Digest. Mary Ann, a power broker in commercial real estate, enlisted a "who's who" team of architects and designers to achieve her specific vision of a grand estate. The interior designer Tighe selected was venerable AD100 designer Bunny Williams. Williams' masterful use of color in the rooms, combined with lovely furnishings and objects both antique and new, creates the grand yet bucolic environment that Tighe envisioned. Our Fern pattern is available in a wide variety of stemware and giftware; the stemware adds an appealing organic element to the table. Each piece is expertly mouth-blown and copper-wheel engraved to give the pattern depth and dimension. Add Fern stemware to your collection to elevate your own table setting! Our Buzzy Honey Jar from the Crystal Collection appears in an inviting feature in the July/August issue of Flower magazine. Entitled "Tea for Two: our favorites for your morning cup or a formal party", this story includes lovely tea cups and other accoutrements for tea service. The Buzzy Honey Jar is one of our classic giftware pieces - it is a perennial favorite wedding, shower and hostess gift. With its beehive shape and swarm of engraved bees, how could anyone possibly resist the charm of Buzzy? Our Honeycomb Honey Jar from the Country Collection makes an appearance in Martha Stewart Weddings Summer 2018 issue, in the Style section's Registry feature. 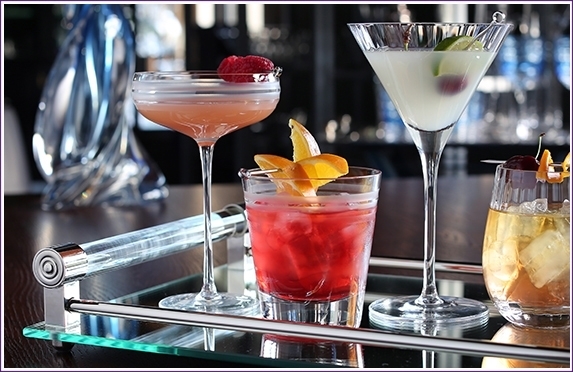 The feature, entitled "Raising the Bar", makes the case for owning barware and tableware suitable for a particular season and/or occasion. Our Honeycomb Honey Jar is featured in Spring, with the tablescape focused on items one would use at a chic brunch. With its lovely amber hue and little engraved bee, our Honeycomb Honey Jar would add a touch of whimsy to any table. And it comes with a delightful palm wood spoon. The Honeycomb Honey Jar makes a wonderful hostess or housewarming gift as well! Our Anita 13" Candlesticks from the Crystal Collection are featured in the July issue of Connecticut Cottages & Gardens, also known by its abbreviation CTC&G. This story in their "Jewelry" column cleverly pairs crystal jewelry with crystal giftware and lighting. If you love sparkling jewels, there's no reason why that love shouldn't extend to your dinner table, your bar, or even your light bulbs! The Anita Candlesticks are sold in pairs, and are also available in an 11" size. Add a pair of these lovely candlesticks to your collection - nothing is prettier than the glow of candlelight at dinner time! Kimberly Schlegel Whitman sets a beautiful table in Traditional Home's "Gatherings" feature in the May/June 2018 issue. Amongst many other lovely elements of the tablescape, our Gloria Large Wines & Goblets and Fern Champagne Flutes help to set an elegant stage. Kimberly's latest book is Parties Around a Punch Bowl; in it, she extols the value of the punch bowl for "keep[ing] both guests and flavors moving". Serving punch is inherently festive and encourages social interaction - when you've finished a cup or glass of punch, you are prompted to get up to refill the glass on your own. Kimberly points out that the flavors can change as ingredients run out and new ones are added to the mix. At a luncheon thrown at her parents' home in Beverly Hills, Kimberly shows us how formal needn't be fussy - instead a formal setting using "relics of yesteryear" can make an event more special, while remaining festive and fun! Pull out the punch bowl you inherited - or buy a new one you love, such as our Wisteria Punch Bowl - to add a bit of retro glamour to your next party! The Wisteria Punch Bowl can also be purchased as part of a Punch Set, with cups and a ladle. Fern is a signature pattern of our Crystal Collection - from its introduction two decades ago until today, this exquisitely engraved botanical pattern continues to delight our customers. Fern transcends trends and is consistently popular, which is why we continue to introduce new pieces in this pattern. We ran an advertisement in the May/June 2018 issue of Flower magazine to showcase some new Fern Vases, all introduced in the past year. We love how the fern pattern "pops" off the page in this photo! We wanted to share photos of our flower arrangements from the April Tabletop Show. Larger retailers usually attend this show, so we made an effort to incorporate Holiday-ready flowers (and virtually an entire pine tree!) into our arrangements. We hope you enjoy these images! Designer Paris Forino featured several William Yeoward Crystal items on her tablescape in 41 Madison's lobby during the April 2018 Tabletop Show. 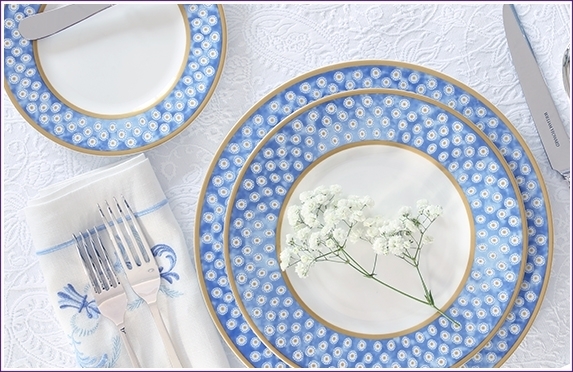 The delightful table, based on the theme "L'apres L'entree: Sweet Treats that Sing Spring", featured lots of pastel shades in the dinnerware and the flowers, evocative of the fresh awakening of Spring. Even the inviting macarons were in pastel shades! Thanks to Paris and Leigh of Paris Forino Design for including us on this lovely table! We were pleased to see our Palmyra Wine glass from our American Bar Collection in Southern Lady's May/June 2018 issue, in their "Mix & Match" feature. In this issue, we see how the table can be set two ways using the same dark green dinner plate with different table setting elements (chargers, glassware, cutlery, etc) in each tablescape. 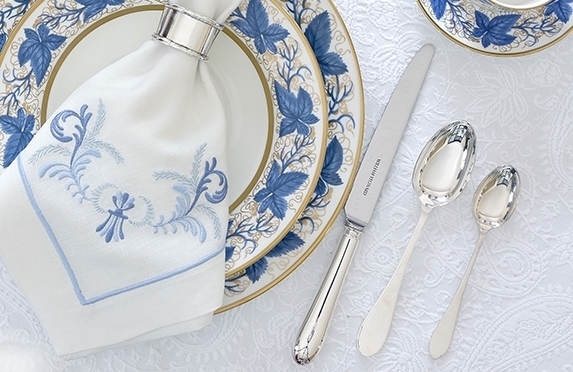 Our Palmyra Wine is a perfect addition to the more formal, sophisticated setting of the two. Our Palmyra stemware is made by hand, and the palm pattern is copper-wheel engraved by artisans trained in centuries-old techniques. 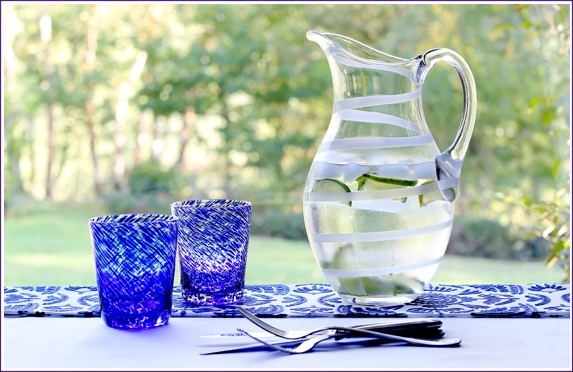 The palm pattern adds whimsy, while the classic shape of the glass elevates the setting. 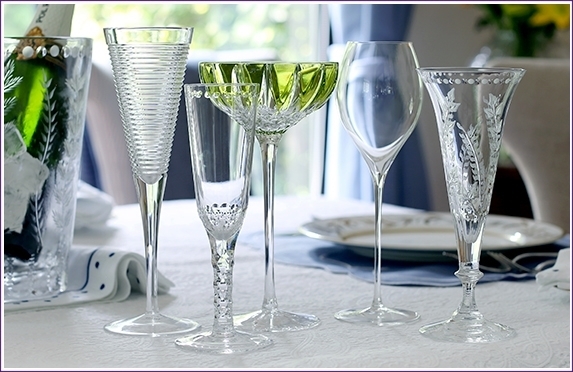 There are other stemware options in Palmyra, as well as barware and giftware: explore them HERE. 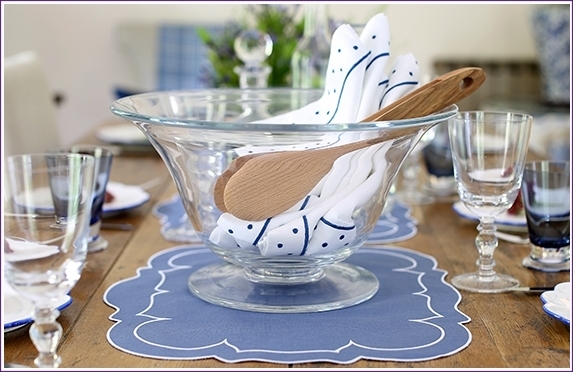 We hope this story encourages you to set lovely tablescapes all summer long! The Palmyra pattern is inspired by the Palmrya Atoll in the Pacific Ocean, where research is conducted to study and hopefully preserve the marine environment, particularly the coral reefs and sea turtles that thrive in the area. William Yeoward Crystal supports these efforts by donating a portion of the sales of all items in the Palmyra pattern to help fund this research. WILLIAM YEOWARD CRYSTAL IS AVAILABLE FROM SOME OF THE FINEST RETAILERS AROUND THE WORLD; TO SEE A WIDE SELECTION AND TO REALLY APPRECIATE THESE BEAUTIFUL PIECES, WE STRONGLY SUGGEST THAT YOU VISIT ONE OF OUR STOCKISTS; SELECT 'FIND A RETAILER', WHERE YOU CAN FIND A STOCKIST THAT IS CONVENIENT FOR YOU. 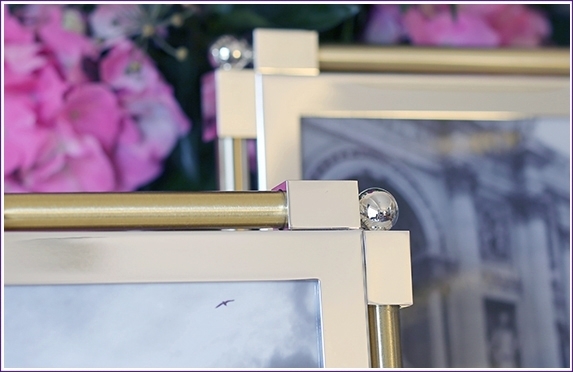 THESE STORES ARE VERY KNOWLEDGABLE ABOUT WILLIAM YEOWARD CRYSTAL AND YOU WILL FIND THEM ENTHUSIASTIC AND HELPFUL WHEN IT COMES TO MAKING YOUR SELECTION.